Crystal Pools has a solid history of performance on a wide variety of government and commercial projects and is the name behind many of Australia’s most innovative and ambitious aquatic projects. With a history of quality without compromise spanning nearly 60 years, Crystal Pools is the benchmark by which all other tenders for your project should be measured. See our list of major projects completed as a guide to our capabilities. From the largest commercial aquatic centres to construction projects conducted in the remoteness of the Australian outback, we offer a technical expertise that’s the envy of others. We are certified for government projects, experienced at working with developers and offer a total design and build service for corporates and smaller businesses alike. In fact, no other pool builder in Australia has the methodology and level of expertise we have gained since 1957. That level of experience breeds natural efficiency and economy and is reflected in the bottom line of every project we do. The result for you is a better build yet at a similar price. From the beginning you also have access to case studies and references from construction companies, builders and councils who’ve relied on our experience to deliver them real results. Our compliance methodology and standards of documentation are second to none. A cornerstone feature of the support we provide is to insulate you from potential headaches in the design and construction process. We offer a single point of contact – one person for you to deal with. Another benefit in working with a single harmonious team is the ease of doing business; combined contract, combined supervision, combined payment systems and more. Expert advice – even before the contract. The best tradespeople in the industry – master builders and craftsmen, many working with us for decades, not months. Accountability – our methodology, expertise and insurances are in place to ensure you remain insulated from any issues. Capability – clients praise us for our onsite problem solving abilities. Operational efficiency – that goes directly to your bottom line. Competitively priced – yet higher in quality. Superior inclusions – innovation proven through rigorous testing. Uncompromising standards of quality – thousands of our swimming pools have stood the test of time. Security – Australian owned and operated since 1957, Crystal Pools is a financially solid company where the directors running the business work throughout the business. Awards – Crystal Pools has won more than 120 major state, national and international pool awards. Accreditation – long standing member of the Master Builders Association, the Housing Industry Association and the National Swimming Pool Institute. As Master Builders and commercial swimming pool specialists, we’ve developed an approach for clients that adds value at every stage of the process. Founded by the legendary Les Denton in 1957, Crystal Pools is known as a pioneer of the Australian Swimming pool industry. Crystal Pools made a big splash on the commercial scene when we were awarded the contract to develop the second stage of the Parramatta Aquatic Centre in 1959. This second stage incorporated two recreational swimming pools and children’s wading pool. 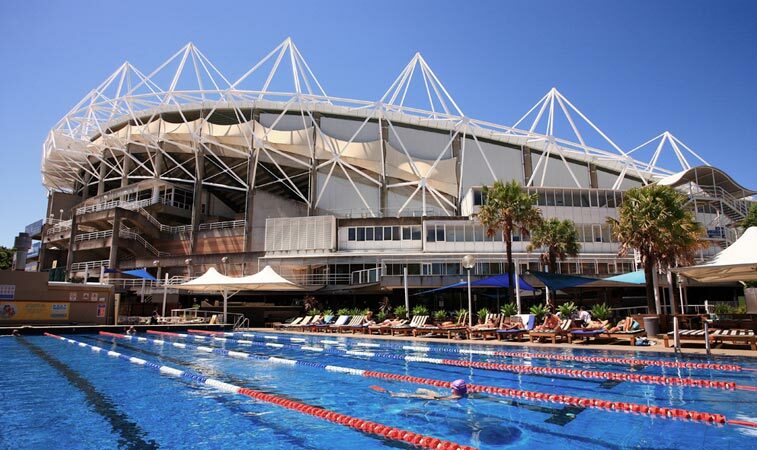 Testament to our exceptional work, Crystal Pools was invited to completely redevelop Parramatta Aquatic Centre in 2008. While the original 50m pool (the stage one pool we weren’t involved in) had to be demolished and re-built, the pools built by Crystal Pools in 1959 required only cosmetic refurbishment. The company’s success on The 1959 Parramatta Aquatic Centre project was soon followed in that decade by other commercial projects throughout New South Wales and the ACT. Our early landmark projects included; Fairfield District Hospital (1964), Trundle Municipal Pool (1965), Tullamore Municipal Pool (1965), Deakin Olympic Centre – ACT (1966), Glenfield Special School (1968), St Joseph’s Hospital Auburn (1968), Macquarie Olympic Centre – ACT (1969) and Admiralty House Kirribilli (1969).